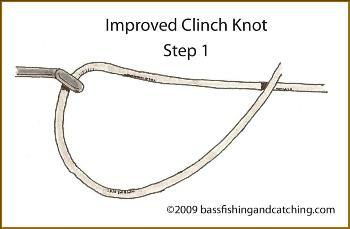 An old standby among fishing knots, the Improved Clinch Knot is an easy knot to tie which probably accounts for much of its popularity. It's good for tying line to hooks, swivels, lures and even flies. It is effective when tied with lines of a maximum 30lb test. Even better, though, is to limit its use to line no greater than 20lb test. I wouldn't suggest using it to tie knots in braided line. This line's forte is knots tied with thin, fine monofilament. 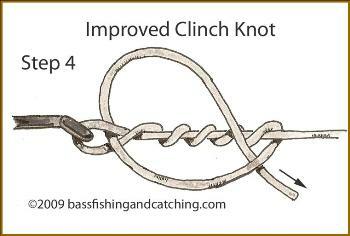 A good knot when you're finesse fishing with light 6-8lb monofilament. Thread a sufficient amount of line through the eye of your hook, swivel, etc. Bring the tag end back "across" the main line. Bring the tag end across and over the main line and wrap it no less than four, no more than six, times around the main line. Bring the tag end back toward the loop opening formed just in front of the eye by the wraps. If you stop at step three by pulling the tag end tight then clipping off the excess you have a Clinch Knot. If you take the next steps, steps four, five and six, you move to what is identified as an "improved" version. Bring the tag end back over the main line and stick its tip through the loop formed in step three. At this point begin to set the knot by "slowly" pulling on the main line. As always, remember to wet your line before setting bass fishing knots. This will minimize the creation of heat from line friction that's damaging to both line and knots. 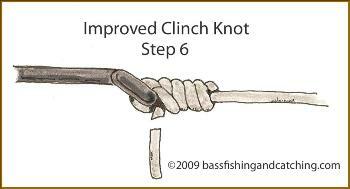 Pull the main line slowly until the knots seats firmly against the hook, lure, etc. Trim the tag line to about 1/8 inch of the knot but no closer. 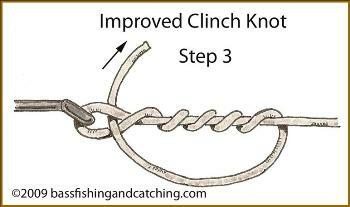 The Improved Clinch Knot could easily be considered a "general purpose" knot among fishing line knots, particularly for monofilament line. 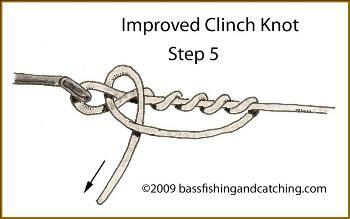 Though it is less strong than a Trilene or Palomar knot it remains strong enough to be the "go-to" knot of many fishermen.